Widespread wildfires are lighting up Indonesia, but these fires were not started accidentally. 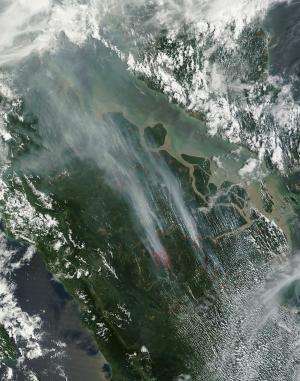 These fires were set deliberately to clear land for palm oil companies. Credit: NASA image courtesy Jeff Schmaltz LANCE/EOSDIS MODIS Rapid Response Team, GSFC. Widespread wildfires are lighting up Indonesia, but these fires were not started accidentally. These fires were set deliberately to clear land for palm oil companies. This type of "slash-and-burn" agricultural has been used for centuries to clear land for new planting, however, the setting of such fires is now illegal in Indonesia. That doesn't seem to be stopping plantation owners from continuing this practice. The Huffington Post reports that Laurel Sutherlin of the Rainforest Action Network, a San Francisco-based environmental organization sent the paper an email stating, "Widespread, illegal burning to clear rainforests and peatlands for palm oil and pulp and paper plantation expansion is unfortunately a well-established yearly ritual in Sumatra." The worst by-product of this practice is the deliterious smog produced by the fires. Smog so lethal that a record high of 401 pollution index was recorded in the city-state at noon on Friday (Aug. 16), according to UK's The Independent. A measurement over 400 is said to be life-threatening to sick and elderly people, the paper notes. Of course, deforestation is also a negative by-product of this practice as well. A staple for cooking throughout Southeast Asia and elsewhere, palm oil is the single largest traded vegetable oil commodity in the world, and global demand is rising rapidly, the U.S. Department of Agriculture says. The oil is increasingly used in the manufacture of cosmetics, soaps, pharmaceuticals and industrial products. It is also used to make biodiesel fuel.